The Morakniv fixed-blade utility knife features a 1.69-Inch hardened stainless steel fixed blade. Hardened stainless steel maintains a clean, durably sharp edge and is extremely resistant to moisture and rust. The non-traditional curved tip of the short blade increases safety and ease-of-use for fine trimming and precise cutting. An ergonomic, soft touch grip handle affords a secure grip for steady control, exactness, and comfort. Ideal for multi-use carpentry, roofing, building, and craft purposes, the Morakniv fixed-blade utility knife comes with an injection-molded, plastic sheath featuring a belt clip and quick-attach button lock system to connect with other Morakniv craft knives. 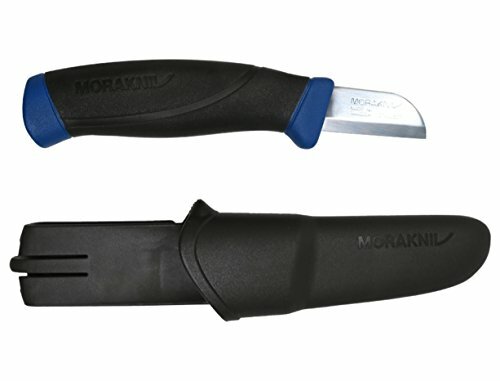 Morakniv has been manufacturing knives with the highest quality materials and workmanship for professional craftsmen and women in Sweden since 1891. Limited lifetime guarantee.